Attractive Calendar For Each Year! 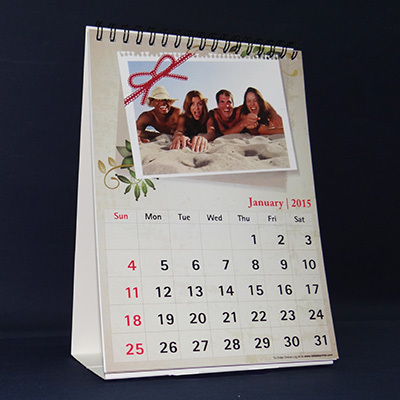 This new year, gift a personal desk calendar to your family with photos of your most memorable moments with your them. Order your customized desktop calendars in latest designs today. * Shipping time is extra based on the location to be shipped. What better way to get your message across, for a quick recall, than printing a personalised calendar for your desk? Reliable prints offers extensive assortment of calendar printing in Mumbai. Calendars imprinted with your business identity and information will make for a perfect gift for your clients. Not just that, you can even personalise a calendar with your favorite holiday photos or family pictures to remind your loved ones of beautiful memories every day. From holidays to events to recording important days of life, plan any moment ahead or record any memory to recall easily and effortlessly with our printed calendars. Reliable prints offers wide selection of photo calendar printing. No matter what your preference is, be it desk calendars in horizontal alignment, desk calendars in vertical alignment, wall calendars or poster calendars, there is a calendar type to suit everyone's liking. Keep it going everyday with the brightness and warmth of personalised calendars and keep everything in check. Add a picture of your little toddler, make it a cuteness overload or pictures of your last fun family trip to live up the nostalgia. If you are a work-o-holic, print your goals as pictures, to remind you everyday of your targets and dreams. Poster Calendars are A3 sized and of single page, to track everything you want in one look. In Poster Calendars, you can add one picture only. Want a calendar with more personalised touch? Grab a wall calendar! You can add a different image for each month and even mark important dates monthly. So next time, you don't forget your wives birthday or the most forgetful day for all husbands (mostly)- marriage anniversay. If you want to give your office desk a more personalised touch or simply motivate your employees, choose the desk calendar. They are available in both horizontal and vertical alignment. Now maintain your timetable always up to date with our easy to use photo calendar online service. All you need to do is select a calendar of your choice, add images, confirm the designed calendar add your delivery details and on payment, your calendar is ready! It's that simple really. If you want to opt for something more readymade, there is an array of readymade calendar templates to select. Capture today, tomorrow, everyday, months and year with a beautiful personalised calendar, imprinted with photos of your choice or your corporate logo and vision. No matter what your purpose is, photo calendar printing makes for an ideal choice. Copyright ©2014-2018 Reliable Prints. All Rights Reserved.